To say, "I'm fond of carrots." is an understatement. Once, while doing a detox cleanse, I ate so many carrots and drank so much carrot juice that my hands and feet turned bright yellow! As it turns out, a glass of carrot juice contains more than 25,000 IUs of Pro-Vitamin A. Extremities turning yellow is called carotenemia, an excess of carotene in the blood – my poor liver could not keep up with converting the carotenes to Vitamin A, so my body decided to store it in my extremities. Lucky for me, and others, that carotenemia is temporary! And the old saying, ‘I liked it so much I bought the company’ rings true with me, too, as I was a co-operative member/owner of The Big Carrot Natural Food Market in Toronto for more than 15 years. Purple carrots get their colour from anthocyanin, a powerful antioxidant that is anti-inflammatory, meaning you will age more slowly. Red carrots contain lycopene, the same antioxidant that makes tomatoes ripe for cancer prevention. Yellow carrots contain lutene which fights macular degeneration and assures development of healthy eyes. Orange carrots have a phytonutrient, called falcarinol, which is being researched for its ability to fight colon cancer. Carrots also boast 4g of fibre per cup (right up there with the average bowl of cereal), making it a great cancer fighter. All carrots are a good source of Vitamin C! One large carrot packs about 20% of your daily needs. Multi-coloured carrots have 20% of your daily need of Vitamin K, a nutrient that works with calcium to strengthen your bones. Carrots have 395 mg of potassium per cup. This nutrient helps to reduce your blood pressure and assure good fluid balance in your tissues. 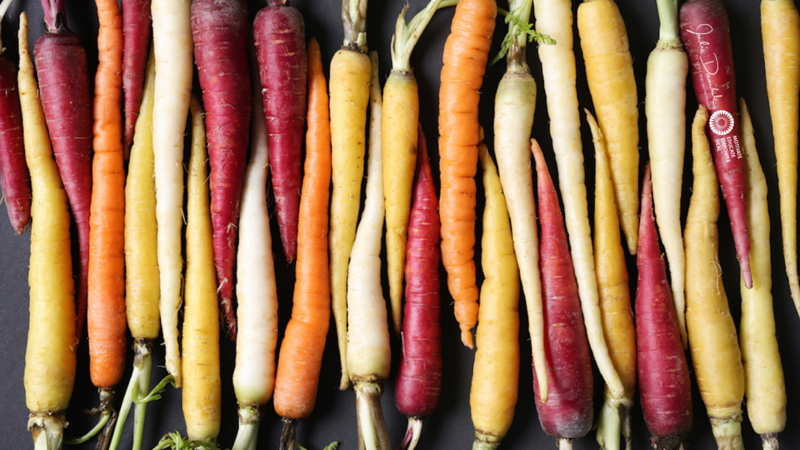 All the many types of heirloom carrots taste different. The purple carrots I tried had a natural pepper back note, the red carrots were fruity and the yellow carrots were sweet and clean. When I got home from the market I decided to keep them raw and make a marinated rainbow carrot salad so that the distinctive tastes could shine through with each bite. As carrots belong to the imbelliferae family, along with their cousins caraway, coriander, cumin, dill and fennel, I decided to spice the salad with those herbs (their flavours blend so perfectly). 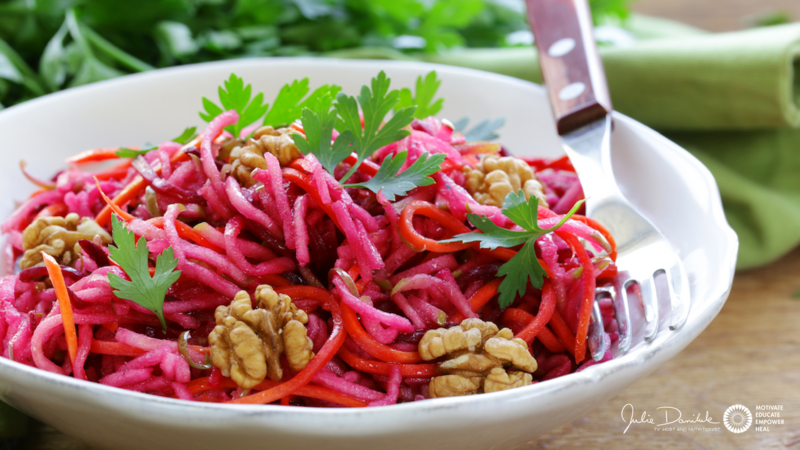 Try my Marinated Rainbow Carrot Salad recipe! Mills JP1, Simon PW, Tanumihardjo SA “Beta-carotene from red carrot maintains vitamin A status, but lycopene bioavailability is lower relative to tomato paste in Mongolian gerbils.” J Nutr. 2007 Jun;137(6):1395-400. Purup S1, Larsen E, Christensen LP. “Differential effects of falcarinol and related aliphatic C(17)-polyacetylenes on intestinal cell proliferation.” J Agric Food Chem. 2009 Sep 23;57(18):8290-6. doi: 10.1021/jf901503a.